Day 4 is upon us. 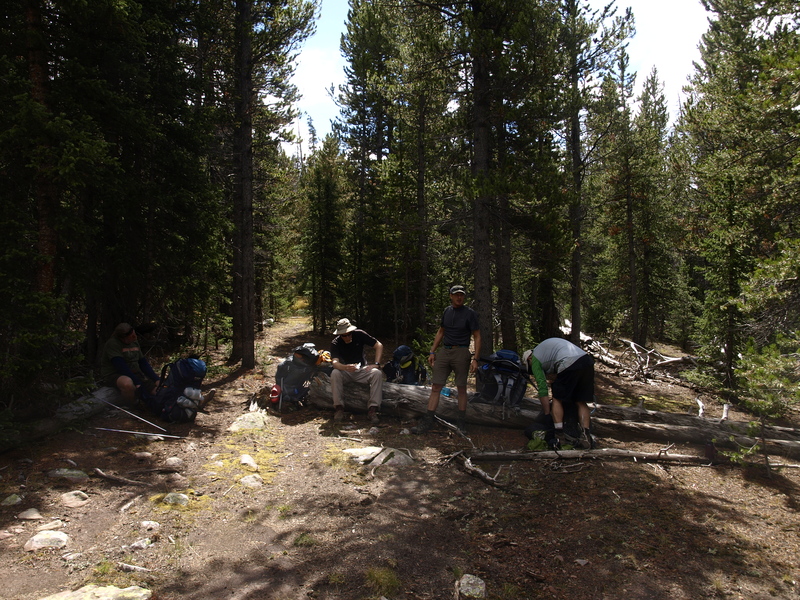 We will be moving camp from our current elevation, back down the Yellowstone, and then up the Bluebell Pass trail to Milk Lake. The net change in elevation will be almost +300′, but we need to lose 600′, and then gain back the 900′. We will be covering some of the same ground that we did on Day 2, however, we will hang a left when we get to the first trail junction. 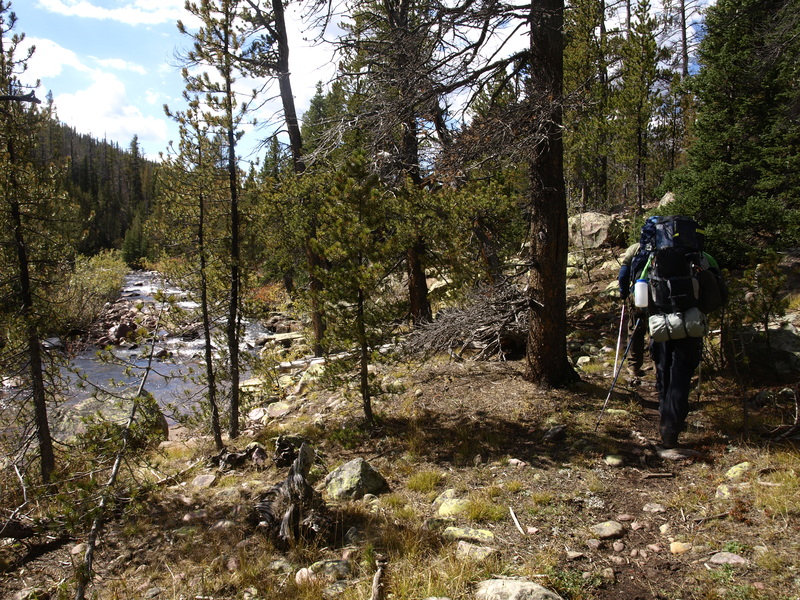 The hike back will have us recross the Yellowstone again, and we will have also to recross Milk Creek, which was a little dodgy the first time. Once we make the left onto Bluebell though, the terrain changes from a long valley walk, to a hill climb. The map indicates switchbacks, but there isn’t anything written which says how many, and how long they last. Reading the map says, there is about 1.2 miles of initial switchbacks, and then it levels off for a bit, re-connects with Milk Creek, and then ascends a little more mildly to the trail junction with Milk Lake. There, a spur will climb the final stretch to the lake where we will commence the search for a fire ring. Day 4 for Andy. 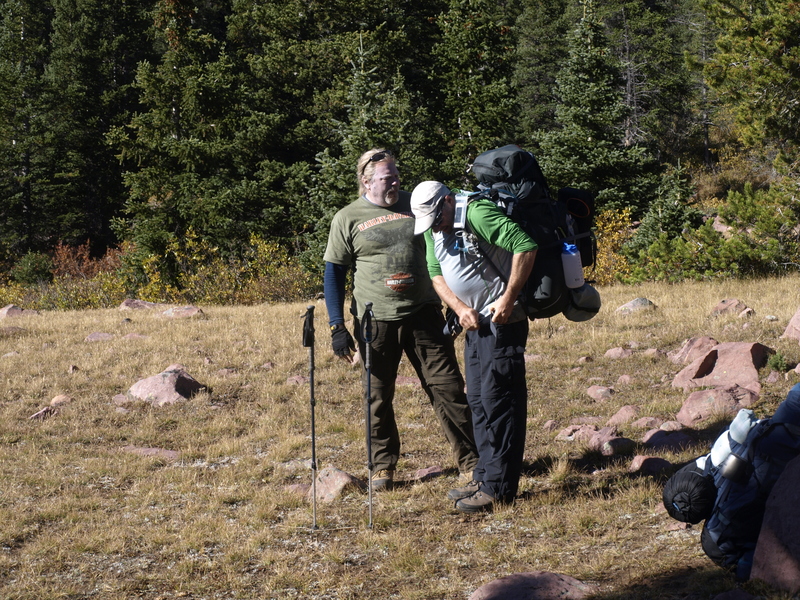 Walt is taking Andy under his wing and will ensure that Andy gets to the destination. Total distance was going to be about 7 miles, maybe 8, where we cover about 4-5 down hill, and then the final 3-4 uphill. Something we were all looking forward to was the possibility of fishing Milk Lake. 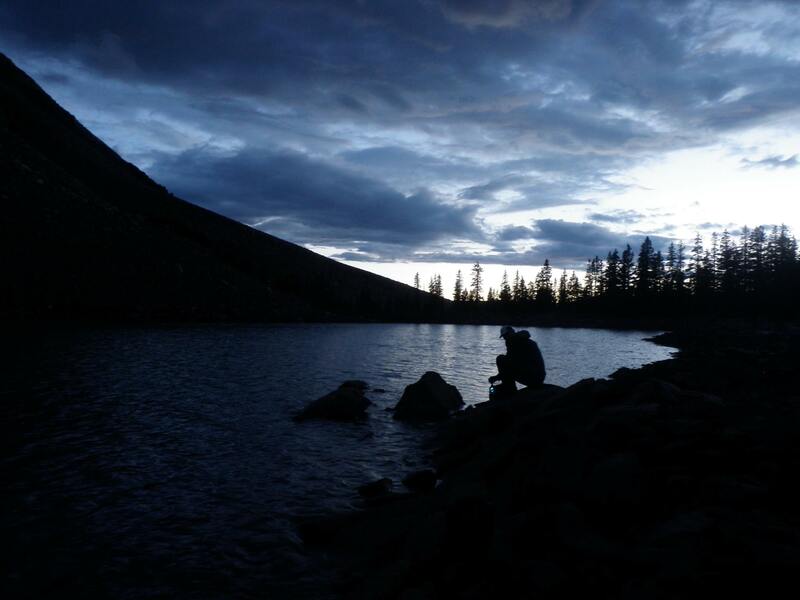 Because of its remoteness, the fishing pressure on it is deemed light, and there were no overuse restrictions applied by the Utah DNR with respect to how closely you could camp to the lake. 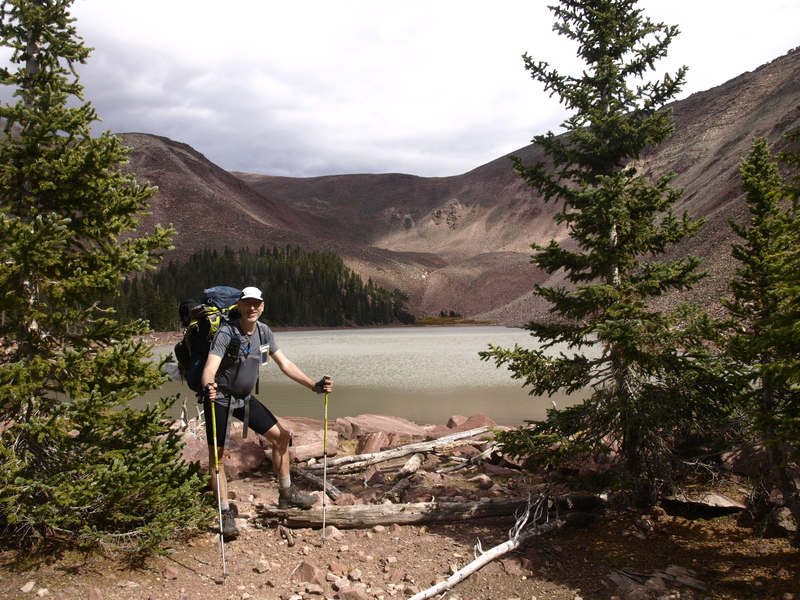 We had noted at the trail head that many of the named lakes in the basins we were exploring had 1/4 mile camping restrictions, meaning that overuse had caused much of the fallen wood to be burned, and that previous parties had chosen to start cutting down trees to burn. 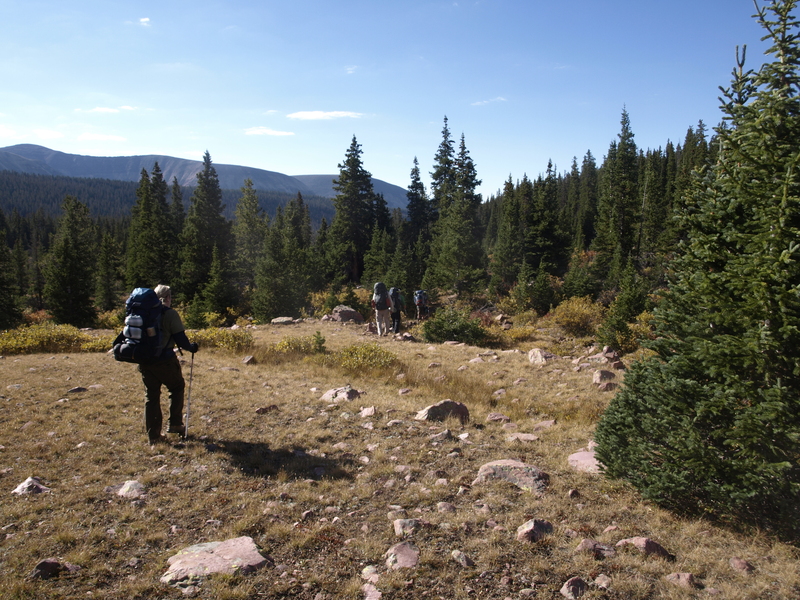 High elevation environments are very sensitive, and growth is a long and slow process. Built into that process is decay. It is the decaying organic matter that provides some of the nutrients to the new growth, so if all the dead matter gets burned, then that leaves little for preserving the local environment. Fungis require dead plant material. I will start out at the back today, so many of my shots will be behind my mates. So, we wouldn’t be restricted on Milk. All we had to do was get there. Today would also be the first day in which we encountered no other people. As it turned out, we didn’t see another person until we reached the trail head parking on Day 7! All that space, and all that time, and we were by ourselves. Sweet! We will be hiking back down into the trees. The concern was getting Andy to Milk Lake. The rest the previous day probably helped him. We lightened his load a little more, and Walt took over the job of setting a pace that was good for Walt, which happened to be good for Andy. Almost all of my pictures from this point forward, will show Walt, closely followed by Andy. For the morning section of hiking I took up a position at the rear and fell back often to snap pictures. That would explain why everyone was in front of me. This kind of wood was lying around everywhere. Dry, hard to cut, dense conifers that burned really well. Nutshell summary of the creek crossings. No one fell in. The Yellowstone crossing went without incident, however I failed to notice that Walt hadn’t finished putting his boots back on, and Andy and I left without him. I noticed fairly quickly that Andy’s guide was missing, but I just thought he was ahead of us. It hadn’t occurred to me that he was still behind us, and we didn’t really confirm this until we got to Milk Creek. Walt expressed some disappointment that we would think he had off and left Andy for the Coyotes, however, hugs were exchanged, and forgiveness granted, and we moved to cross Milk Creek. Funny thing happens when time passes, and a creek drains a limited area. As water drains out, unless there is a big storm to replenish the supply, the overall flow declines. Milk Creek was 4 inches lower on our return than it was 2 days earlier. 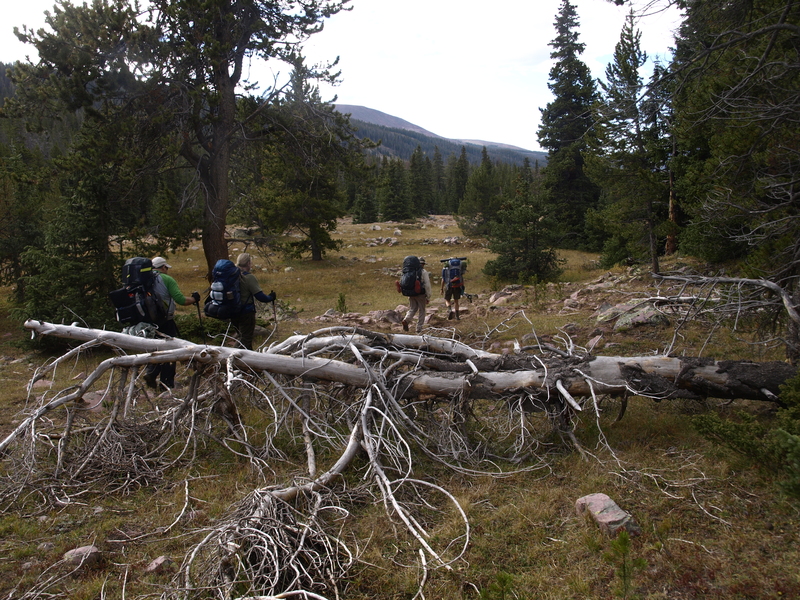 We crossed in a breeze, and took the opportunity to hydrate, and Steripen some water. We don’t want to climb with too much water, but we do need to drink as we climb. We all worked to drink up regularly all morning raising our individual hydration levels, so we only needed about 4L of water. The trail up Bluebell was an eye opener. 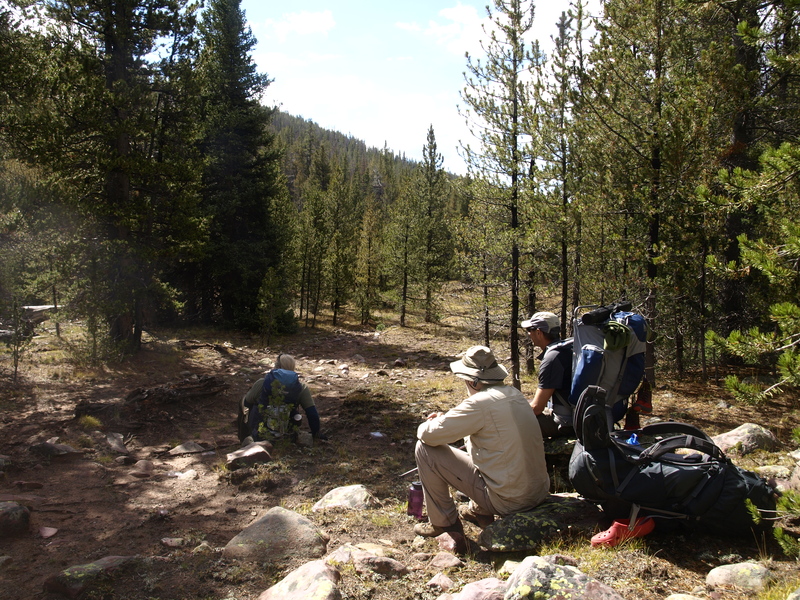 To this point we hadn’t really encountered anything that steep along the Yellowstone, nor even the day hike to Kings. The steepness was there, the switchbacks were there, and the steepness and the switchbacks were married together. Usually a switchback itself is a little steep but the crossing back across the grain is somewhat mild. Not along this trail section. We gained elevation, and we gained it rather quickly and we kept gaining it. One secret, while ascending in a forest, is to keep your eye glancing at the base of trees higher than you. If it is dark, then you still have a way to go, however, as you approach the local summit, the sky starts to peer through. That lets you know the grade will be flattening out, and gives you a little motivation to kick in that last effort to get to the flat ground. Larry and I were both looking for that, and were relieved when that blue sky started to reveal itself. We didn’t eat anything when we topped off with water, so the plan was to gain this first flat level, and then find a nice place to sit and relax. Larry and I carried on to reconnect with Milk Creek where we expected we might have a nicer view along the creek, than we currently had. The trail angled NE and it wasn’t long before we could hear the creek, which turned out to be far below us, and the hillside had the appearance of old hydrology mining techniques. We decided to keep going and were rewarded with a spot that was about 30′ above the creek, and offered some far reaching views, and plenty of large downed trees for seats. 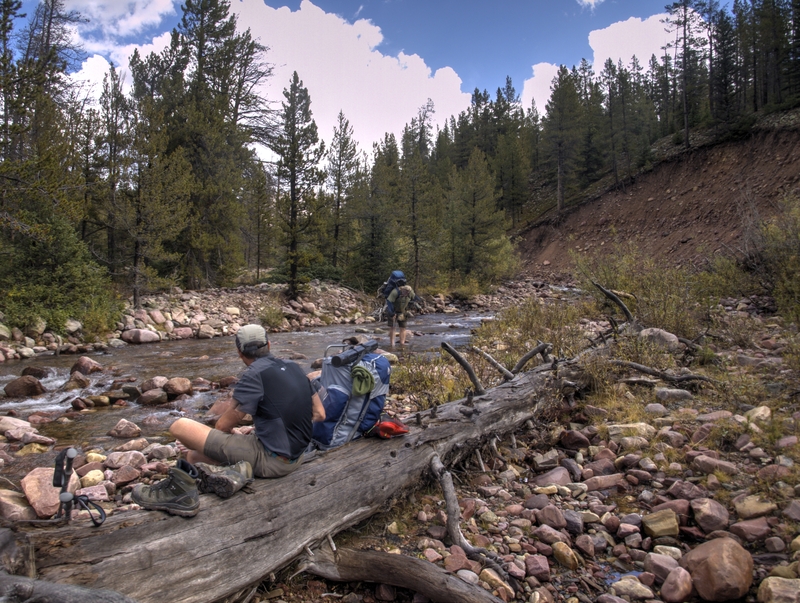 After lunch, it was time for Larry and I to move on ahead, attain Milk Creek, find a camp site, and settle in. 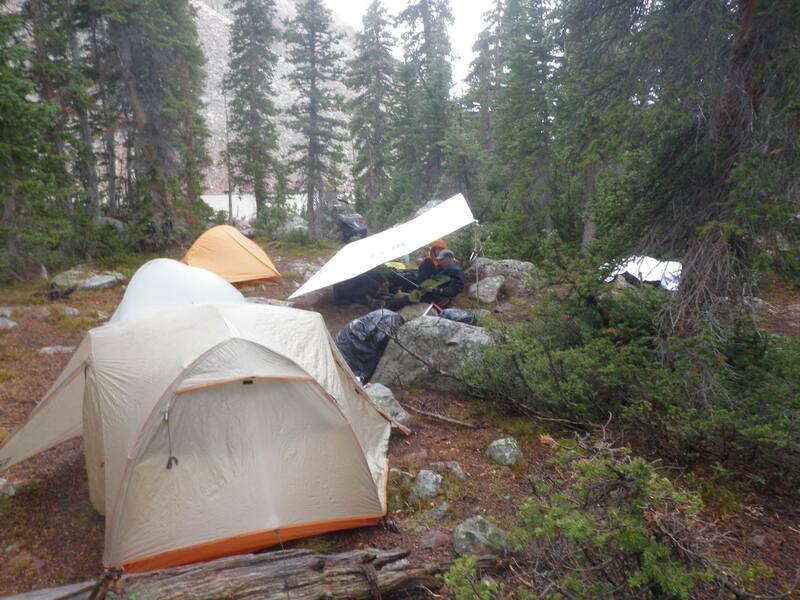 The appearance of potential weather added an urgency to getting camp set up. 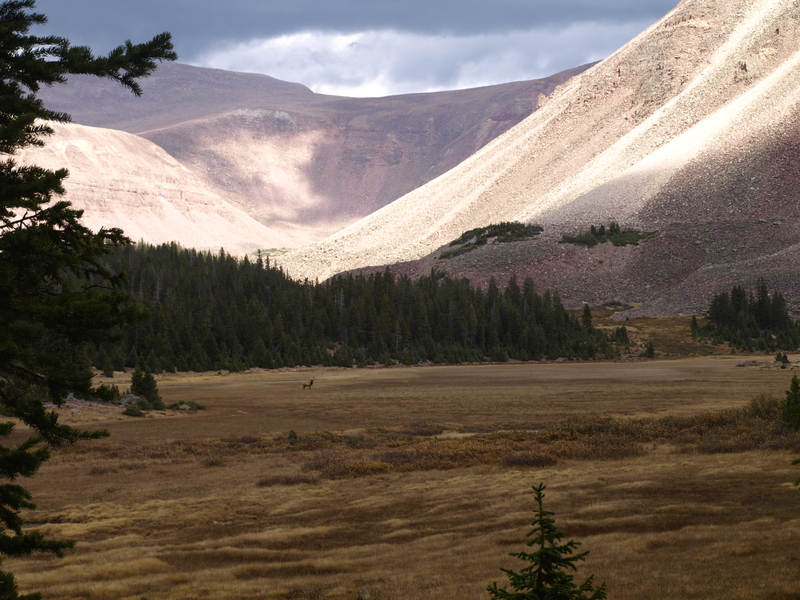 Nothing was upon us yet, but I think you can see from the pictures that follow, dark clouds were around, and yet, the surrounding ridges had bright sunshine for some magical contrast. The light today and the clouds were excellent! 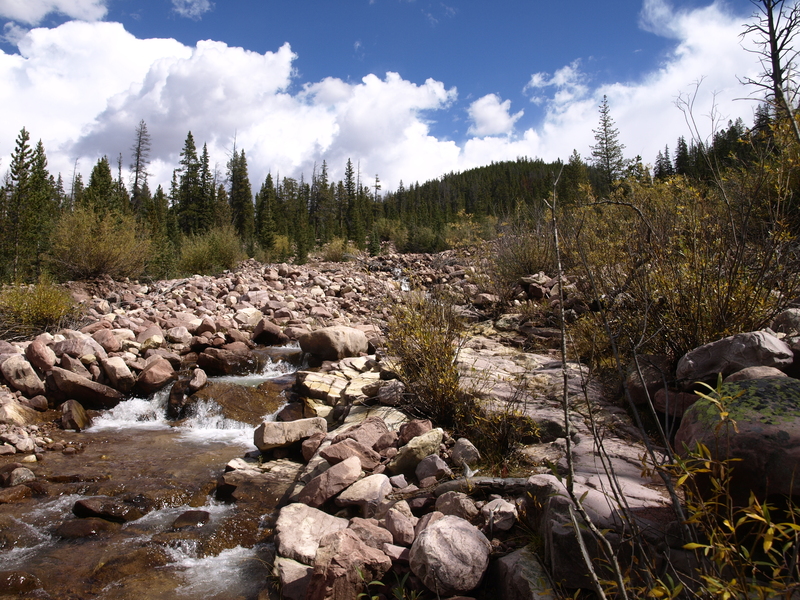 Good Bye Milk Creek, until we see each other a little higher up. The trail angled back to an Easterly path, and gained elevation again, though not as steep as before. 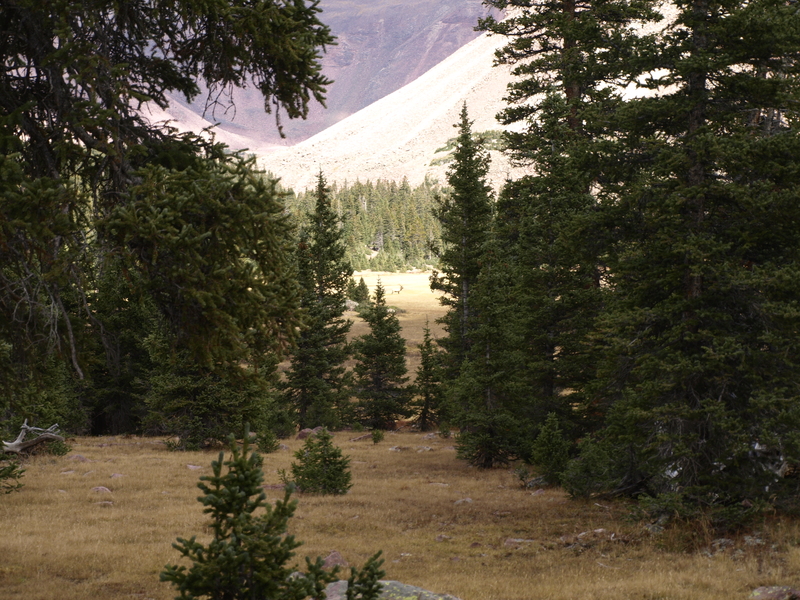 We quickly gained ground on our companions, and as we reached the next high elevation meadow, we broke out to bear witness to a massive bull Elk. We emerged from the forest down wind of this beautiful animal, so he had no warning of our approach. The first picture is our first sighting, and then we moved along the edge of the meadow to get a better viewing location. He did eventually notice our movements, and this triggered his safety response. My telephoto capability was limited, but you might be able to zoom in and get some idea of his size. Stately. A nice log to get some rest on. We climbed the last few sections, grabbed some pictures at another trail junction, and ascended the final meters to the Milk Lake Dam on what turned out to be the emergency overflow spillway. There were some interesting informational signs at the trailhead regarding the early settlers to the area who formed their own water management company and came up and built the first editions of these damns to capture the water. The growing season in that part of Utah was very short, and they just couldn’t tolerate the droughts, so they captured water in the high elevation reservoirs, and drew upon that water down in the valleys. I think this might be out of place. We found a nice site, sheltered in the trees, accessible to the lake and surrounded by downed wood galore. A fire ring made it perfect and we guided our crew over. By that time we could feel the impending rain, so we acted fast. I dropped by pack and quickly chose a place relatively close to the fire ring to erect my tarp. This time I went with a full lean-to style configuration with one edge as high as my poles could allow, and the opposite edge at ground level. That would offer the maximum amount of space for all of us to tuck in out from the weather when it came. Come it did. No sooner had I tightened all the guy lines, then the first rain started to fall. 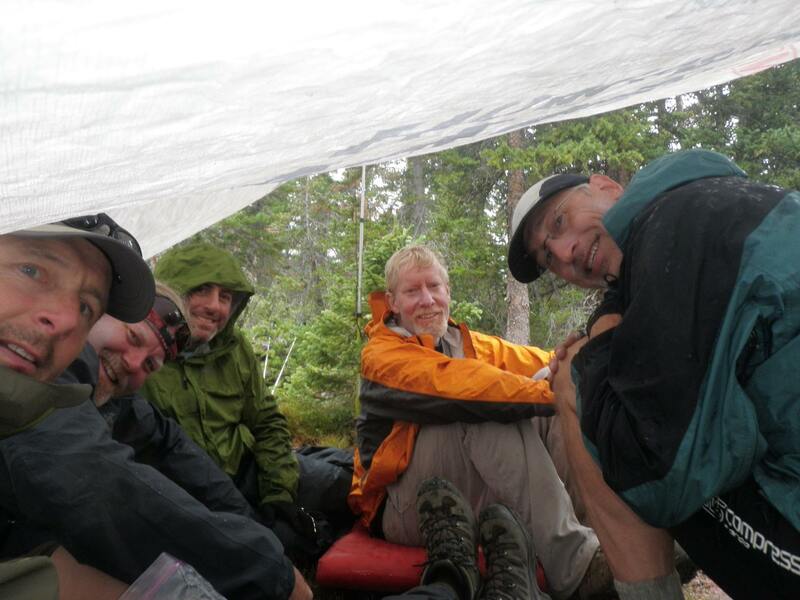 We all secured our pack covers on our packs, and ducked under the tarp. Larry had the cool head about him to quickly gather a lot of small and medium branches into a pile, and covered it with my sleeping ground cloth to keep it dry. Good move Larry!! 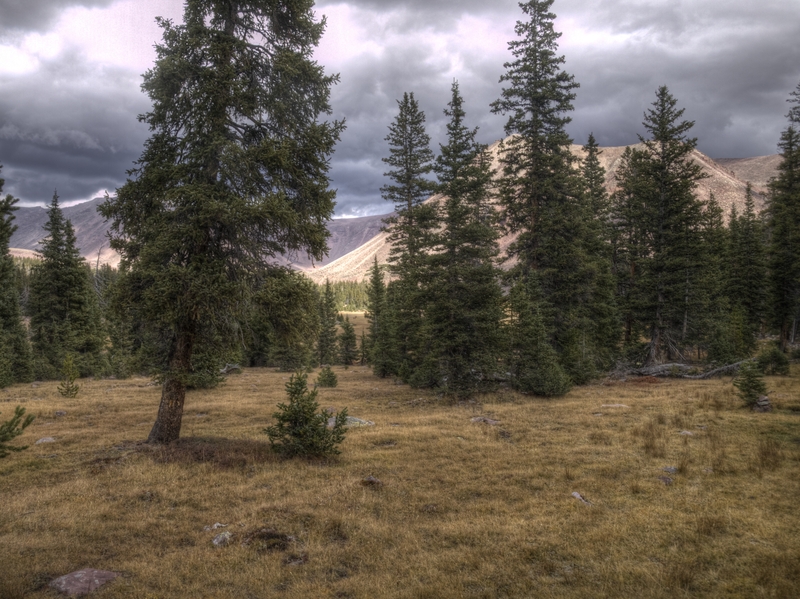 Approaching the meadow with the Elk. This was not simply a passing thunderhead. It was a system of thunderheads, so we had periods of heavy and light rain. When it lightened up, we could emerge from the shelter to grab extra items. We grabbed our chairs first; On later reprieves, we grabbed clothing. I for one was still in my shorts. Remember that I had elected not to bring my rain pants??? That was a bad decision. As the rain cycled on and off, it got colder, and I had to change to get warm. 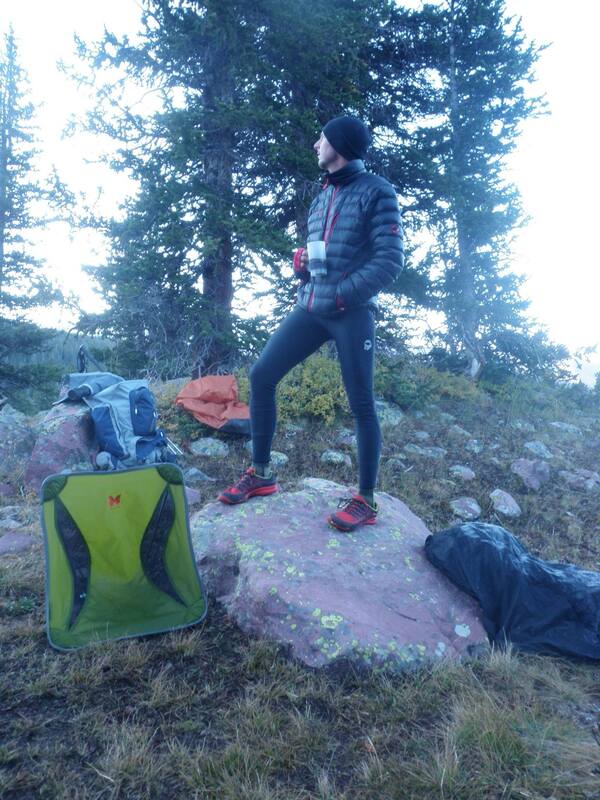 Soon I had my thermal cycling tights on, my SS, a LS, a cycling shirt, and my down vest on. Then I was finally comfortable! Our first sighting of the Elk. Out there in the middle of the field in the bright sunshine. Before the storm was over we had two sessions in which small gravel sized hail fell as well. At two miles of elevation, that is two miles less altitude for hail to fall through and thus melt before hitting the ground. We hardly ever see that stuff in Jersey. After moving around to the edge of the meadow, we still had a clear shot of him. To be completely honest here, I have to report that we attained camp at about 3:30pm giving us ample time to make camp, and plenty of time to fish. It rained about an hour, and sadly, I fell asleep in my chair. When I awoke, it was 7pm and we hadn’t a fire, and we hadn’t gotten water. What we did apparently have is 3 14″ Brook Trout courtesy of Larry and Walt. I was chilled, so I started cutting wood to warm up. While Greg got the fire started, I grabbed my Steripen and started treating water. 90 seconds per 1L at a time. Process 1L and transfer that to my 6-7L dromedary bag. We had 6-8 L bottles, and two dromedary bags. That usually gave us enough water for dinners, breakfast, evening beer concentrates, and more than enough left over for general hydration as well as enough to begin the morning hike. 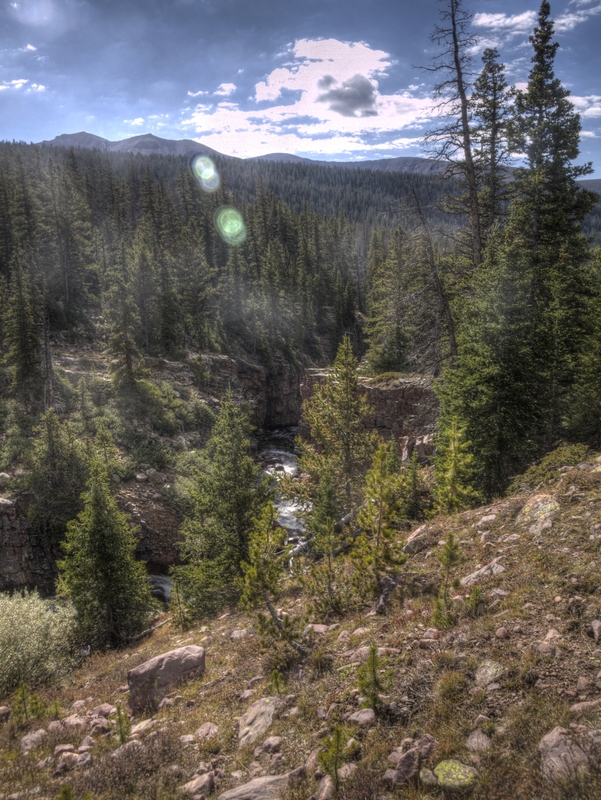 This shot shows the weather threat that had moved in contrasted with the bright sunshine on the talus slopes. Walt usually handled the dinner water, but he was out fishing, so I took over this night. I set myself beside the fire for warmth, and gathered all the food bags, the stoves, fuel canisters, and water pots, and set to work. In case I haven’t mentioned the technical details of dinner re-hydration, these packages come sealed with a drying packet contained within. Open the package, remove the agar packet, read the directions to get the number of cups to add, and the time to set. Add 1.5 to 2 cups of hot water, and then stir to get everything mixed and interacting with the water. The bags are sealable, so seal them up, and let the bags set for 10-15 minutes. Long spoons are needed to get to the bottom of the bag when it is ready, and after it is all consumed, the fire takes care of the trash, leaving just simple residue behind. Let’s talks about the beer concentrate. What we brought with us is a product in which the manufacturer was able to ferment a concentrated malt liquid to a high degree of alcohol percentage. There were two “Styles”, an IPA style (dark), and a Pale Ale style (light). Only two components are needed to make it beer. Component 1 is simply cold water. We had plenty of that!! The second component is carbon dioxide. Each beer packet marries with an ascorbic acid/something else packet. This dry ingredient is water activated, so the mixing container allows us to store a little water in the cap, attach an inner container with the dry ingredient and then screw the cap tightly onto a larger container with the concentrate and enough water to bring the fluid volume to 16oz. There is a lever built into the cap that releases the water into the inner chamber, thus creating CO2. The process involves shaking the container up and down for 3 seconds, and then cycling the lever to release excess pressure. 1 minute later, set the container down to rest, and repeat for the other style. Personally we found that mixing one of each, and then blending the two together produced a more desirable end product than any of the two constituent parts. Good thing I had this tarp!! I got it setup just in the nick of time. After a beer or two, and dinner was all gone, it was time for the Trout. We went simple. 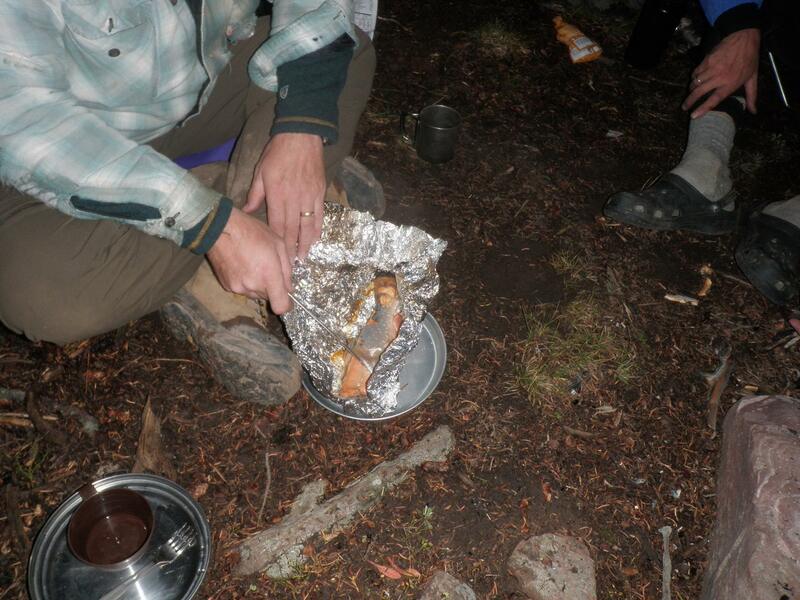 Each whole cleaned headless trout was wrapped in heavy foil, and all three were placed on some hot coals to bake. Some hot logs were placed on top, and the 10 minute ticker was started. Our campsite at Milk Lake. Both Larry and Walt took one package and began to process the cooked remains. I have to give Larry credit as his fish seemed to separate from its bone a lot easier than Walt’s thus leaving healthy chunky sized morsels of trout flesh delectable to the human palette. Trout was shared, and when Walt gave up on his skeleton, I took over and sucked more meat from the bones. The third fish was a little more cooked, but not any less enjoyable. Devoured quickly it was, and soon we had nothing but personal recollections of our protein treat. We needed to catch more fish. Sadly those would be the only ones we would eat. A silhouette of me Steripening water. You might be able to see the light in the water bottle. Beers, cigarettes, whiskey, talk …… Bed. One of three 14″ Brook Trout that Larry and Walt had caught. 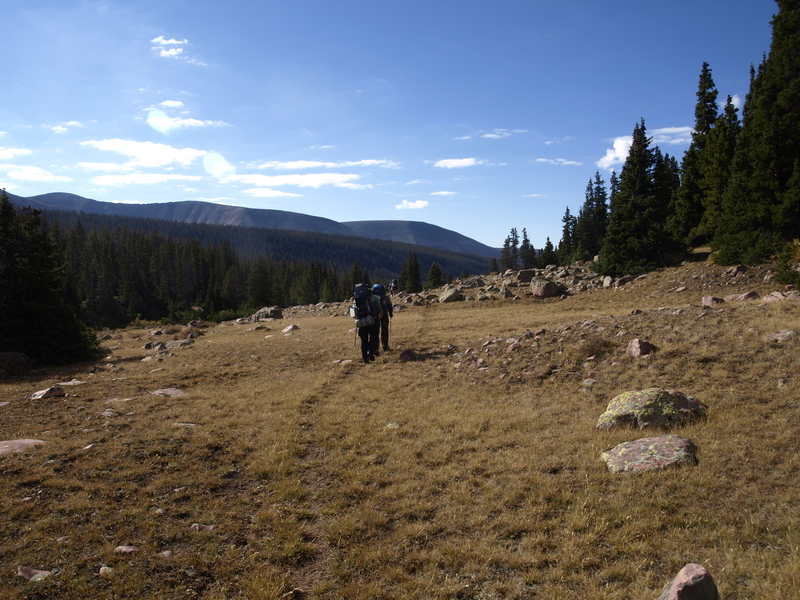 You are currently reading High Uintas Wilderness – Day 4 – Unexpected Pleasures at Big Bird's Adventures.